How did I get two days behind? The last post was about what we did Monday night. This is Thursday night and we’re in Minnesota. We’re staying at this beautiful KOA Park in Albert Lea, Minnesota. Last night we were in Chamberlain. SD. I’m really sorry about this, but I have to go back to Tuesday in Murdo. We got up Tuesday morning and attended a wonderful breakfast held in my honor at the Star Restaurant. I have come a long way from the days when only the cream of the crop got to work at Cafe 16.That’s what the Star was called back then. Frank and Pearl McCurdy owned it. Anyway, those cream of the crop girls made a boat load of tip money waiting tables at Cafe 16. I never got to work at a prestigious place like that because I had to rent rooms at Mom’s Chalet Motel, and then turn around and clean them in the morning. Yes…I was a chamber maid. The only summer I did something different was when I bailed on Mom to go work at the Frosty Freeze because Connie Jackson worked there and I wanted to be like Connie. That didn’t exactly work out because Connie didn’t work there that summer. Excuse me a second here. 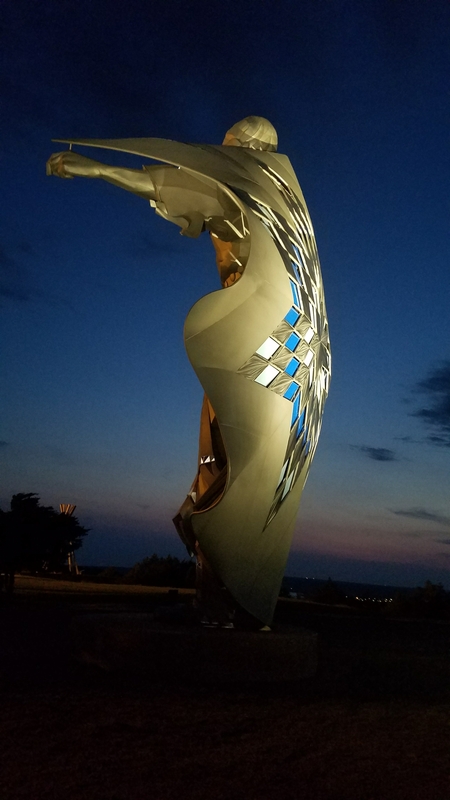 I was informed today that some people are following this blog because I said I was going to write about the two month epic road trip we’re on and they’re not that interested in my “Murdo Girl goes to Murdo” stories. 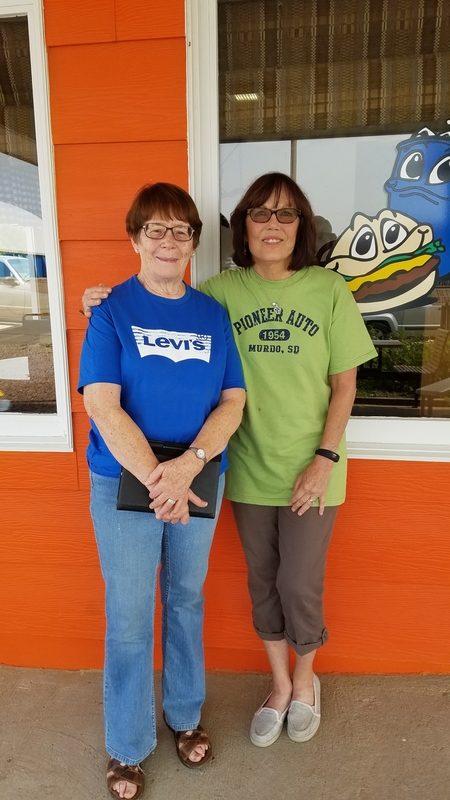 We left Murdo on Wednesday morning and traveled to Presho to attend a luncheon in my honor at Hutch’s Restaurant. As soon as we pulled into the parking lot we saw a crazed fan run out to greet us. When I entered the restaurant, I was quickly rushed to my seat. Kip eventually got through the crowded room and was seated beside me. The people hosting the rather lavish luncheon were so filled with awe and excitement, they could hardly talk, so I did my best to keep things going. I love it when I don’t have to talk over other people. Eventually the invited guests found their voices, so I concentrated on eating my chicken fingers and fries. After lunch I spent some time autographing my recent books. Man O man was I getting tired. I perked up a little when they started handing me lavish gifts. Words can’t do them justice, so I’ll have someone draw some photos for you. They won’t be autographed, however. Back off from the bag Kitty and stay away from my Bings. Seriously, it was a day that will forever be remembered by me as one of the highlights of my life. How often do you get the opportunity to meet, for the first time, someone you have felt a close friendship with for a couple of years. I don’t know how I got to be so blessed to have these amazing women in my life. 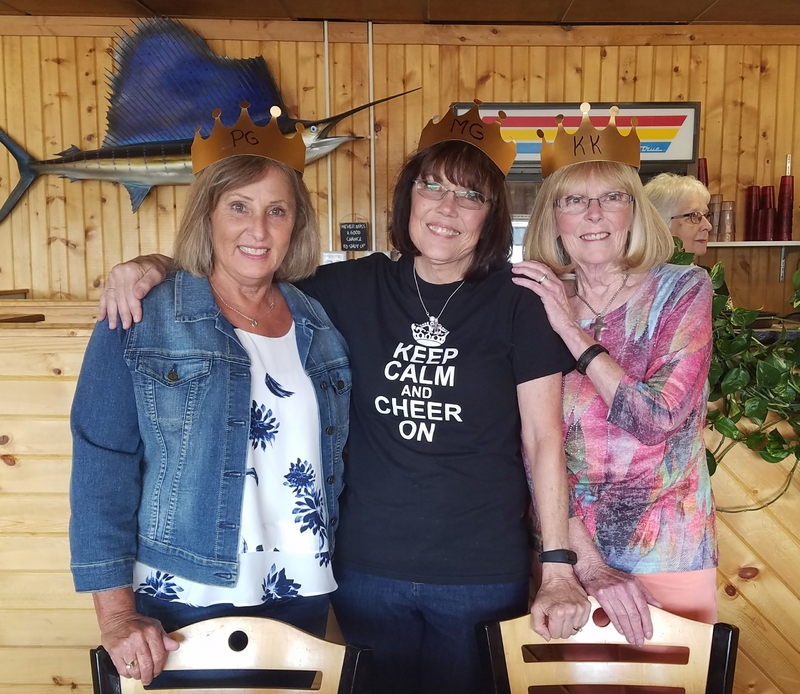 I crowned them…love you Sherri Miller, aka crazed fan, on the left, and Dianna Diehm aka Pearl like, on the right. Amber Diehm, the beautiful girl in the top photo is Dianna’s daughter. Her dog Arf, is Soo’-tah in Dakota’s Story. After the breakfast in my honor on Wednesday, I was rushed to the home of Sheila Hurst for a private coffee party. Wouldn’t you know it? We were stopped by what we thought might be the press, but it turned out to be relatives. It was so nice to visit with my cousin Terry and his wife, Kay. Shortly after that, I had to leave. It was time for me to meet Teresa Palmer at the Murdo Drive-in. She had a twist cone and I had the shake that will one day be named MG’s shakin rhubarb shake…in my honor. Teresa is a neat person. I consider her a good friend and it was fun to spend some time with her. Besides that, I love having my picture taken in front of the drive-in. It’s painted my favorite color. Let’s see what else? Oh right. I dropped by my old grade school to see Tammy Lindquist Van Dam. Imagine my surprise when I saw my sign. Tammy knows how much I love signs and banners. After we left the school, we went to see the 1880 town. It was great. We especially loved the “Dances with Wolves” display. I’m sorry I don’t have pictures of it. It’s very impressive. These are some of the original buildings featured. I’m going to post this post…post haste. Kip and I have to get back on the road this beautiful Friday morning. I’m not finished with my Murdo tell all, so stay tuned. Wait until you find out what my old football team did. Yup…the guys I used to date finally touched base with me. No pun intended. I have no words…I mean I can’t find the right words..Where do I start? Our three days in Murdo were even better than I could have imagined and we all know I can be a pretty creative thinker. 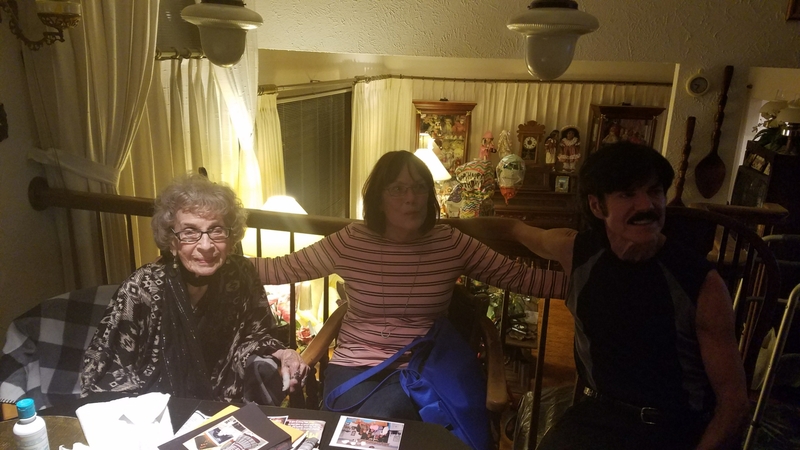 Monday night, Kip and I drove out to the beautiful LandMark Country Inn and spent a great couple of hours with my cousin Mark, Dave, and Mark’s mom…Aunt Irma Sanderson. This great lady is 97 years young and looks fabulous. She says the secret to her longevity is Mark, which is credit he certainly deserves. She tells me her youthful figure is owed to walking up and down the stairs several times a day. 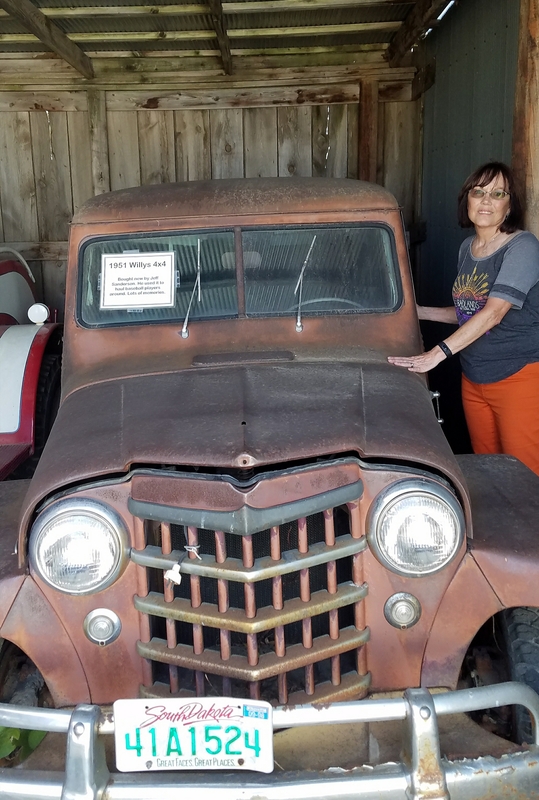 Me with Uncle Jeff’s Jeep…now housed at the Pioneer Auto Museum in Murdo. The guys who grew up in Murdo back in the 50’s and 60’s and played baseball, probably rode in Uncle Jeff’s Jeep. I should have taken more and better pictures. I knew it! I should have been using hand cream more regularly. I should have, at the very least, sawed off the uneven edges of my nails with the old worn down emory board I’m pretty sure I packed. Just before we left home, I filed and polished my toenails. I had found some orange polish with sparkles in it at Dollar General and thought it would look good. Kip cringes when he sees me with nail polish or hair dye. He knows when I’m finished, parts of something will be a new color…like our now sparkly kitchen floor. I haven’t found anything that will remove those sparkles. My trusty Mr. Clean pads that take hair dye off of light switch plates, didn’t even work. Wow, I really got sidetracked didn’t I? After I gave this same explanation to Aunt Irma, she dropped my hand and we resumed listening to Mark tell us hilarious stories about his aunt, who happened to be my mother. I thought I had heard them all, but I was once again brought to tears by laughter. Aunt Irma seemed to be fascinated by the expression on Kip’s face as he listened to Mark telling us how his “Aunt Loretta” had trained him in the art of making money in the motel business. She first gave him a few examples of her tricks, I mean methods that she had successfully used to get the customers to pay just a little bit more for a room than they had planned to. To test her trainee, she laid down on the floor between the bed and the wall and listened to Mark talking to a tourist. When the transaction had been completed, she raised up and shared her feedback. She had sneaked into the room when Mark wasn’t looking, and when she raised up off the floor, he nearly hit the ceiling! Mark was tenacious, I’ll give him that. It appears he learned the art of room renting by using some of Mom’s techniques to maximize profits, resulting in a successful business. “Never leave a dollar up for grabs,” was her mantra. There is another story that involves chasing down a customer with Mark’s car and Mom, in her training mode, riding shotgun. I don’t think I’ve got the energy to explain that one tonight. By the end of an evening of constant laughter, I remembered why growing up with my cousin Mark had been so much fun. We went through all 12 grades together and had the ingenuity to create our own fun. I wrote a lot about this in the earlier blogs I wrote. We both played the Alto Sax in the band and switched chairs several times a year. The one sitting on the other’s left, got elbowed in the side continuously, and the other one got socked in the upper arm so much we always had a lump under the skin and a black and blue upper arm. Mr. Palmer just shook his head and made us change places again. He hoped we cared who was first or second. Mark and I played a saxophone duet in a contest and got a superior plus! We both had an older brother who went off to college which left us the only kid at home. We took Uncle Jeff’s Jeep places it sometimes shouldn’t have gone. We randomly picked names out of the phone book and made crank calls. We made a competition out of it by seeing who could keep the poor person on the other end talking the longest. Once Mark convinced a guy he was his long lost army buddy. I laughed so hard, I couldn’t breathe. Most of what we did was harmless fun. We didn’t wait for entertainment to seek us out, we made it happen. It’s great to revisit fun times and tell hilarious stories with someone you have shared those experiences with. It’s even more special when you share grandparents, aunts, uncles and cousins who are all…one of a kind. More Murdo visit blogs to come! The wonderful rhubarb shake at the Murdo Drive-in. This is your last day to get one before they close for the winter! I’m going to shed a tear or two when we fire up the motor home and pull out of Murdo this morning. I’m overwhelmed with emotion. Kip just said, “You’re going to cry when we leave aren’t you? I didn’t cry when we left my hometown of Laramie and all of the girls I used to date,” he said. That was the wrong thing for him to say. I will admit, he was a good sport about hauling me around and taking pictures of me with all of my friends. He even got to talk a little. He hasn’t mentioned yet that we never did see any of my old boyfriends. We all know about the girls he used to date in high school. So what? Nobody made him a sign. I love this girl I used to babysit. She is so loyal. When she was pretty little, she conned someone into giving her a ride to Mom’s motel where I was renting out rooms. She said she really needed to talk to me. She was crying so hard it was difficult to understand her. She said I had to come and take care of her. Her aunt was babysitting and she wasn’t much fun. Tammy was not happy with me either when I told her I couldn’t leave. She was dragged out of there kicking and screaming. I’m surprised she hasn’t held a grudge. I love this picture of Kip at breakfast yesterday morning. He was happy with the size of his pancakes. Neither of us has met a meal on this trip we didn’t like. This is for you, Billy! (He made me promise I would take Kip to the Buffalo for a steak.) This is Kip’s first attempt at an us-ie. The steak was excellent and I want to complement Amy who was our server. She was the best and I don’t think she even realized that I’m Murdo Girl. Is she new in town? I’m going to stop here. I wanted to get a little something on the blog this morning, but I need some time to write the details of our time in Murdo. There is so much to tell. We’re going to the City Park now for one last walk with the dogs. There is already a veil of mist covering my eyes. My heart hurts and so does my back, my neck, and my knees. Kip thinks it’s my age and arthritis kicking in. He’s not thinking right. It’s melancholy. I will write more and share my wonderful photos later today! 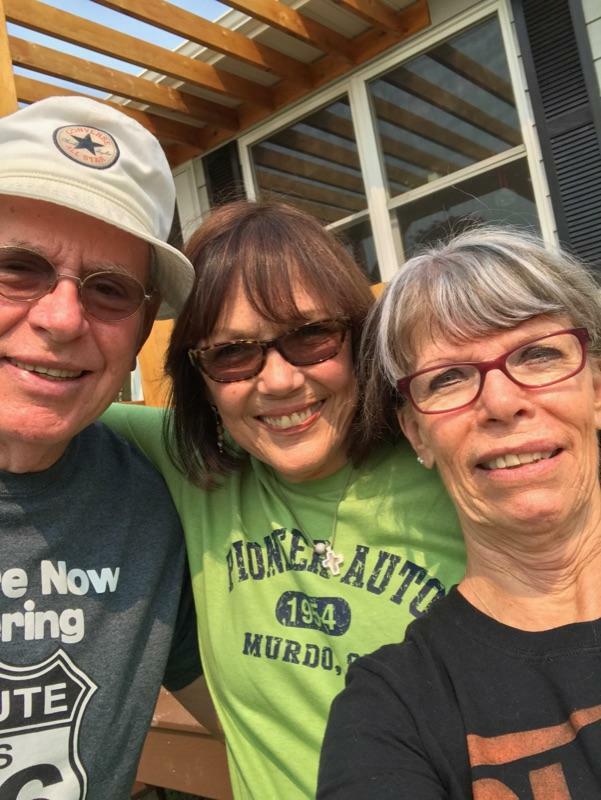 Murdo Girl…the road trip..all roads lead to Murdo. I love being here in Murdo. I love being from Murdo. Murdo has more personality in it’s newly refurbished water tower than most places have in their whole main street. Thanks Kerri Venard for suggesting I go see the water tower. Do these Orange pants make me look fat? You might think I don’t know what I’m talking about, but I do. Not only have I lived in the great State of South Dakota; I have lived in Wyoming, Colorado, California and Texas. It is important that I say something here. I have lived in a small lake community in Texas for nineteen years. Kip and I have been blessed with a group of friends that understand that friendship is a lifelong commitment. This group of people share birthdays, Tuesday night dinners, good times, and bad, successes and failures. They are there for each other no matter what! I have learned so much from this close-knit group about true friendship, which requires you to give as well as get. Pettiness or selfish actions don’t feel right, and martyrdom doesn’t either. There is nothing better than a true friendship and nothing worse than a shallow one. I probably could have stopped halfway through that explanation, but I need lots of reminders. I don’t do the friendship thing perfectly, but I try to learn from the example of friendships I admire. There was a block of time during which I lost touch with my Murdo family of friends. Earlier today, I heard a knock on the RV door and it turned out to be someone I had considered one of my best friends from the 7th grade through high school. I haven’t seen her very often in the past forty years, but when I have, the minute we start talking, I feel the friendship we share. We helped each other grow up, and sometimes it was hard to watch, but that’s the kind of friend you remember your whole life. Does Karen make me look short? It would take a while to find our Senior pics, but trust me, Karen has been in a time warp. She looks the same. I cut the pic off at the waist because Karen makes me look fat and short…and I was still wearing the orange pants. 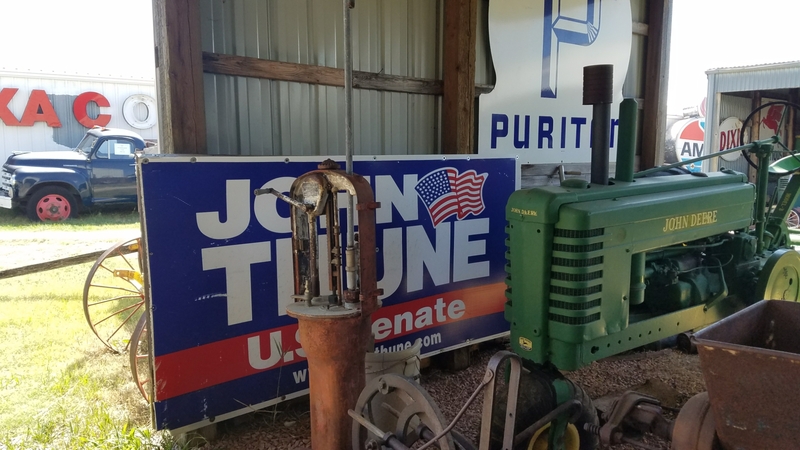 Just ignore the John Thune sign. I can’t seem to get away from them. I found our red convertible, Lav! The sign said don’t touch, but you know what a rule follower I am! Good thing I had the paper crown in my purse. Excuse me Senator, this is my blog. Well, I have people out there who are clamoring to see me. I just had a few seconds to dash this off, and I won’t have time to stir stuff up if I don’t get going. I’m already behind with my reporting to all of you who hang onto my every word. 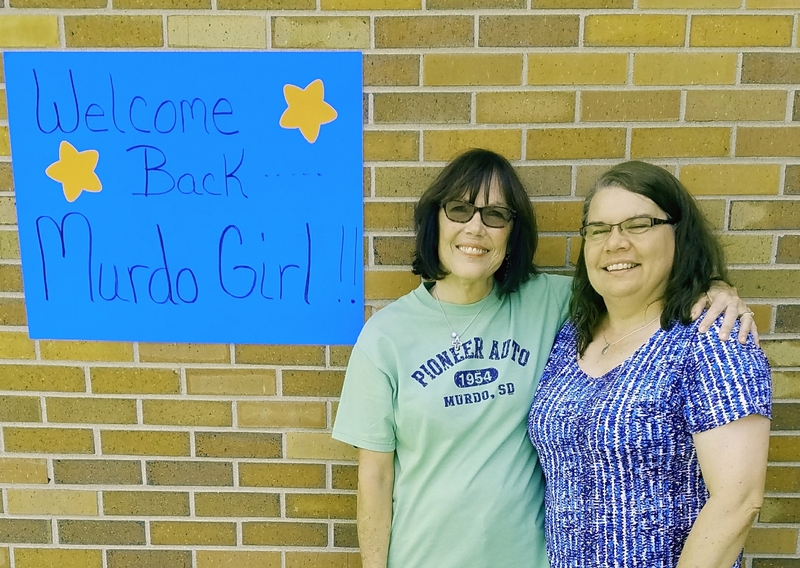 Someone told me there is another Murdo Girl…get outta here! No, I mean it!! Get out of my Murdo!! I’M IN MURDO!!! Actually, I should say WE MADE IT TO MURDO!! We left the Motel 6 in Rapid City and never looked back. It took us all day to get here, but that’s okay. Cyndie and Sammie are so happy to once again enjoy the comforts of home. We drove through the Badlands National Park, and it was spectacular. The day was sunny, the temperature was in the 70’s, and there was no wind. Let me also say we were really grateful we had the National Parks pass you can get if you’re a senior citizen. Without it the fee would have been $40.00. We had taken Highway 44 out of Rapid City to 240, which brought us to Interstate 90 right at the town of Wall…Perfect! 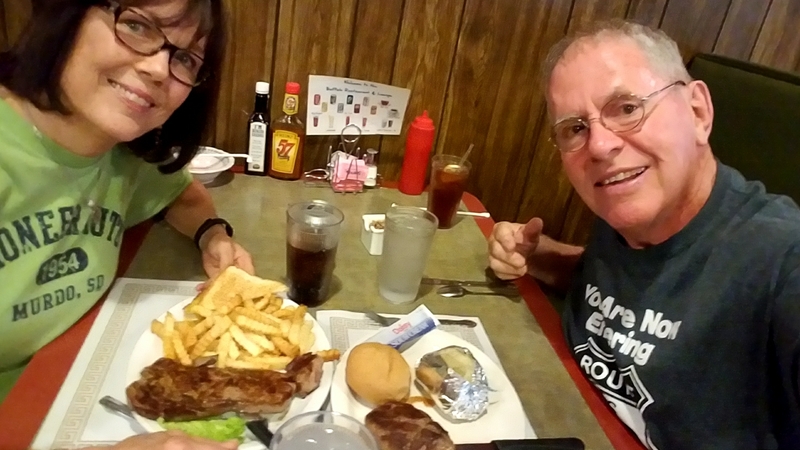 I had promised a friend, fellow Murdoite and seasoned blogger, Judy Dykstra Brown, that I would take Kip to the famous Wall Drug for a hot beef sandwich and cherry pie. It turned out to be an excellent choice. It was every bit as good as the hot beef sandwiches I had eaten at Fern’s Cafe and Mack’s Cafe when I was growing up in Murdo. Kip added a vanilla milkshake made with homeade ice cream which he said was excellent. We also added to our T shirt collection. Fat and happy, we headed for Murdo. I was a little worried because I hadn’t made a reservation at the only RV Park in town. We were really fortunate and got one of the last two spots they had. It’s really a nice park. I didn’t want to cause a lot of commotion tonight, so I haven’t told anyone we’re here. (Well, except for my friends Sherri and Dianna, but they live in Pierre.) Unless they read the blog, people won’t know that we were on our way to Murdo. Going through Kadoka…home of Kodak Kadoka. Sorry Kim Lindquist Deuter, you were still at work in Philip. 1880 Town… Kip and I are going to see it tomorrow if we can squeeze it in. I’ve been thinking and I’m worried. Maybe I should have at least told my relatives I was coming… or maybe….Wait a minute. This is so ridiculous. I am the Queen of stirring stuff up. I’ll make a big deal over myself in the morning…after I’m rested. Whew! I can’t wait to tell you all about it! In the meantime, I’ll polish up the old crown. We couldn’t have planned the day any better. After breakfast at Mickey D’s, we located the football field where our grandson Mason’s game was to be played. The whole area was absolutely beautiful. 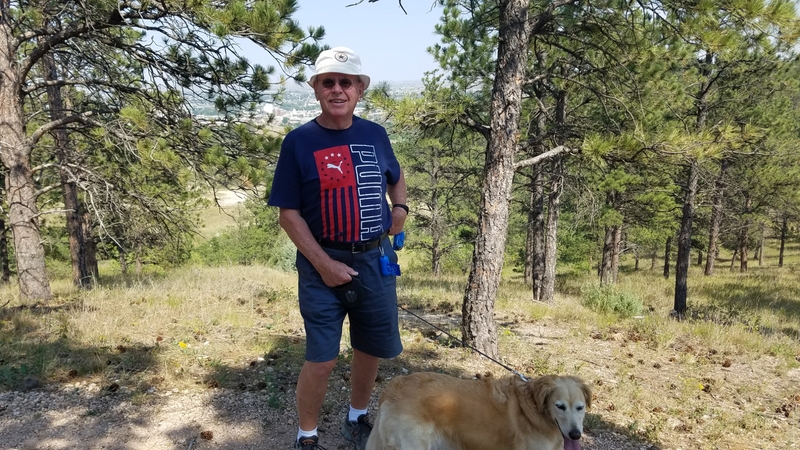 One thing we can say about Rapid City is it has countless beautiful parks. The football field was first rate and the surrounding flower gardens, soccer fields, bike and walking paths, all following along a clear creek, seemed to go on forever. 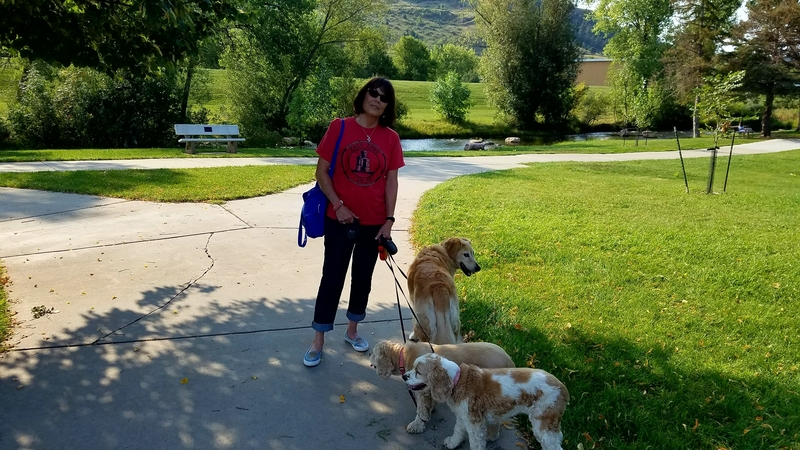 We arrived early and enjoyed a long walk with the dogs before Mason’s team got there. Mason Sr, Amy, and Ethan made it a little before game time. By then, Kip and the dogs had attracted quite a crowd. The right team won. The Thunder Basin, Bolts beat the Rapid City, Cobblers 32 -0. Mason had a great game! Ethan is in 4th grade. He plays quarterback on his league football team, the Steelers. Just as the game was finishing up, Kip’s cell phone rang. It was the RV shop calling to tell us SeeYa was ready to go. Kip took the dogs and went to check it out before meeting all of us for a celebratory lunch at The Texas Road House. After saying goodbye to the family, we picked up our beautiful home and took it to a self service place to wash. Afterwords, we went to Perkin’s Restaurant for more food…and more dessert. Sometime tomorrow, SeeYa will be rolling into Murdo with the king and queen of roly poly… Kip and Murdo Girl, along with their three worn out puppy dogs, and one very bored cat. Does The Murdo Drive-In still make those delicious rhubarb milkshakes? 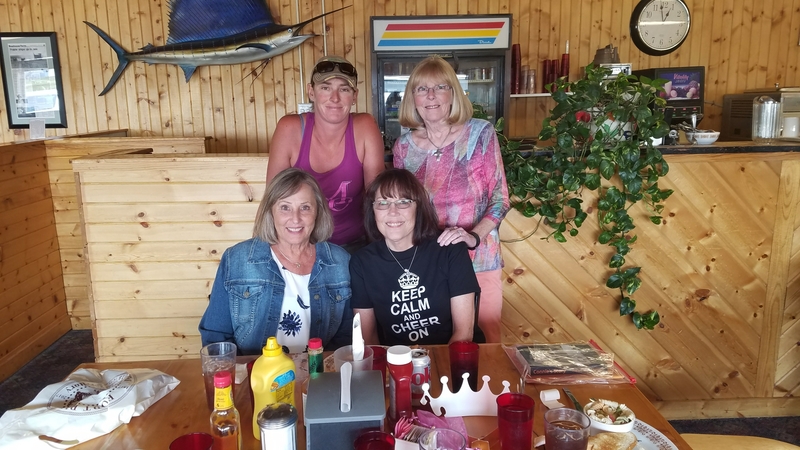 Murdo Girl…the road less traveled trip.. I sure hope we haven’t lost any of you who have been hanging in there hoping Kip and I, the three dogs and the cat would be able to continue our epic journey. I have not complained once about the disappointment I have experienced because I have not been able to write much about actually going somewhere. I did tell Kip today that if we had to spend one more night here, I was going shopping for new drapes and a BBQ grill. We drove out to Dakota RV this morning expecting to be told the parts were in and we could pick up SeeYa in a couple of hours. The dogs and I waited in the car while Kip went in to check on things. A few minutes later, I saw him walking back to the car. I couldn’t read the expression on his face, but let’s just say, all his teeth were showing but he wasn’t smiling. A few minutes later, we pulled up to our new favorite sub place. It’s called Jimmy John’s. While Kip was ordering, his phone rang. He told me to grab a pen and write down the tracking number the guy on the other end was going to give me. We brought our subs back to the motel and Kip got on the phone to the people who mistakenly sent the parts to Vermillion. I was proud of the way he handled the situation. He convinced the supplier to overnight another package of parts to Dakota RV, who said they would have the mechanic there tomorrow to do the work. I believe this time it is really going to happen and so does Kip. 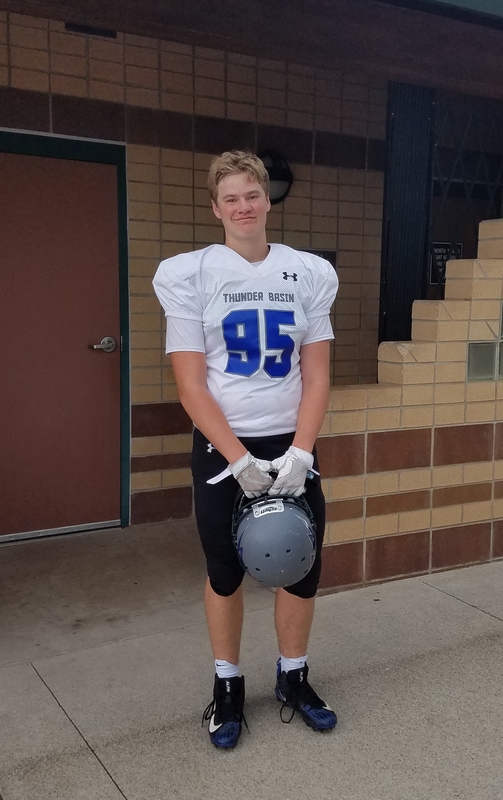 Meanwhile, our grandson, Mason’s first season football game is right here in Rapid City tomorrow morning at 10:00, and we will be there to cheer him on. Tonight, we went downtown and treated ourselves to a nice dinner. The downtown area is really fun and as I keep saying, the weather couldn’t be nicer. We’re excited for tomorrow, and it looks like we won’t need new drapes. LEAVE THE LIGHT ON…HERE WE COME!! 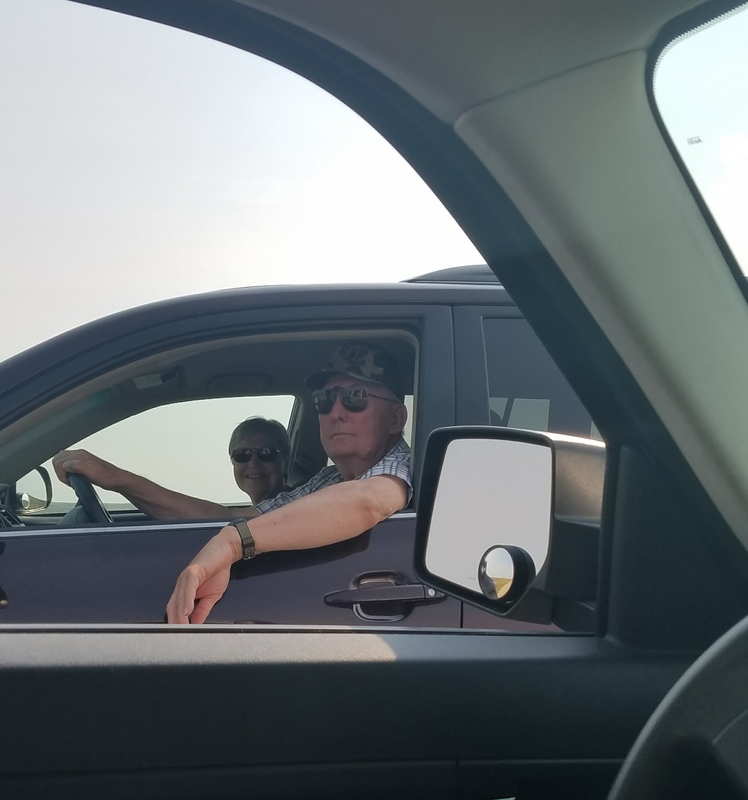 Murdo Girl…the road trip..will I ever get to Murdo? We’re afraid to make plans. When we bought the motor home, everyone we knew who had an RV, told us to be ready for everything, but don’t count on anything. If you decided on the camping life to save money on restaurants and hotels, you are doing it for the wrong reasons. If you are unable or unwilling to be flexible, maybe a cruise would be a better option. Kip and I listened to all of this, and I’m glad we did. At least we went into it with our eyes wide open. This is our third, long RV trip, and being sidelined this week was our biggest hiccup so far. I’m proud to say, we have handled it pretty well. Considering we are traveling with all of our animals, it’s been rather remarkable. The cat is the only one who is displaying crankiness. We watched her tonight and had to laugh at her antics. She was laying in wait for a dog to walk past her so she could bat them with her paw. They didn’t know they were supposed to be her punching bag, so she finally ran and jumped on Pattie, who was the closest to her and whacked her a couple of times. It dawned on me that she is like the spoiled little sister in the family. The one who is allowed to act how ever she wants to because the word no just upsets her and nobody wants to deal with the fit that will follow. Pattie looked at me with resignation. She knew it was easier to let the cat be mean than to do something that would irritate her even more. Tomorrow we will have been residing in room 161 of the Motel 6 for a week. Sometimes it’s better not to know the outcome of certain situations. It’s best just to deal with each day as it comes and hope for the best. Stay in denial as long as possible. If we hadn’t been stuck here. I never would have found these cool rain boots! Since we haven’t told any Murdo family we’re coming, we will only stop to say hello to those we can catch. I plan to drive Kip by the places he hears me talk about all the time. Billy said I have to take him to the Pioneer Auto Museum and he has to have a steak at the Buffalo Bar. We will drive the parade route which will take him by the Mack’s Cafe building, and the Harold Thune Auditorium. We will go to the cemetary, and see everything south of old Highway 16. Can you think of anything else? Maybe we can have a cup of coffee at the truck stop and someone I know will be there. After Murdo, we will be heading East. We’ll be going places I have never been and seeing good friends along the way. We really do love the RV life. We just didn’t know the Motel 6 was going to be such a big part of the experience. I know this isn’t much of a blog, but at least it’s short. I was on the verge of making plans and that’s never a good idea for seasoned campers like us. Before I begin my story, I must correct myself on the origin of the word, annigrocery. My brother, Billy, first replaced anniversary with annigrocery. Our cousin Valerie and Billy himself, informed me that it was indeed Billy that first said the word that is now a family favorite. If you like the word, go ahead and use it. As far as I know, he doesn’t have a patent on it, and it’s such a great word! We travelers needed something fun to do today while we waited for the call that our motor home was ready. I suggested we take the dogs to the petrified forest. It was sunny and a comfortable 73 degrees as we prepared for our trek into the wilderness. The start of all the trails into the petrified forest is at the top of Skyline Drive. It is up past Dinosaur Park, which is on a pretty steep hill. 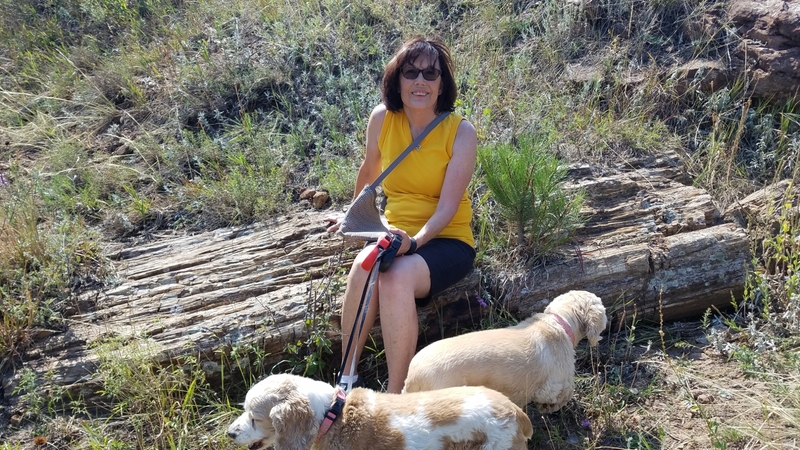 We put the leashes on the three dogs and picked a trail, which was a blind choice, because there was no map telling us where any of them led or how far they went. As we walked the narrow trail single file, we serpentined around the mountain. We finally came to a fork in the road. Kip asked me which one I thought we should take. I said that walking downhill was hurting my knees, so we needed to either stay on flat ground or go up. I’m also afraid of heights, so if at all possible we needed to stay on a flat trail. Kip sighed loudly and asked me how we were going to find a flat trail on the side of a hill? He told me to choose so I did. I kept seeing these signs that said we were in the Skyline Wilderness Area and to call 911 in case of an emergency. It even told us our location number, which I assume would be given to the rescue people who would come to search for us. I started to get hot and very thirsty. I had left my cold drink in the car. I silently chastised myself for not getting a free refill of my diet coke at Wendy’s. I vowed to give what little was left to my dogs if they needed it. We had been wandering in the wilderness for about fifteen minutes when it dawned on me that we hadn’t seen any petrified trees. I told Kip we needed to hurry up and find the petrified wood soon, so I could take some pictures before we all became too parched. My throat started to feel like I was trying to swallow sawdust. I felt like that guy in The Good, The Bad, and The Ugly movie. He was hallucinating in the desert. He had flies landing on his face. He kept seeing water only to find out it wasn’t water at all, but a mirage. He told me to walk backwards. When I looked out, I was acutely aware of how high up we were. Rapid City was way down there. I began to doubt any of these trails would get us out of this unending wilderness area. We gave the dogs a drink from the water bowl Kip had remembered to bring, and turned the Jeep toward the Motel 6. Yes..we’re still there. The brand new motor they put in the RV turned out to be defective. We will find out what our options are tomorrow.